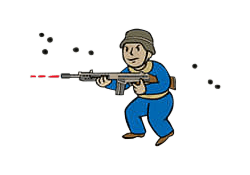 Commando is a Perk in Fallout 4. It is associated with the Agility Stat. Rank 1: Rigorous combat training means automatic weapons do 20% more damage. Rank 3: Your automatic weapons now do 60% more damage. Hip fire accuracy is improved even more. Rank 4: Your automatic weapons now do 80% more damage and gain a chance to stagger opponents. Rank 5: Your automatic weapons now do double damage and gain a greater chance to stagger opponents. Does it affect Minigun and Gatling Laser as well? If yes - do both perks stack?